Interns usually have a certain reputation of being undermined by their company’s full-time employees and bosses. The stereotypical intern seems to do menial work such as, get coffee and doughnuts for the rest of the company, go down the hallway to collect reports from the printer, or even clean up messes that they didn’t make. You get the gist; interns have a lot of tasks that are completely unrelated to what their job originally entailed when they were first hired. 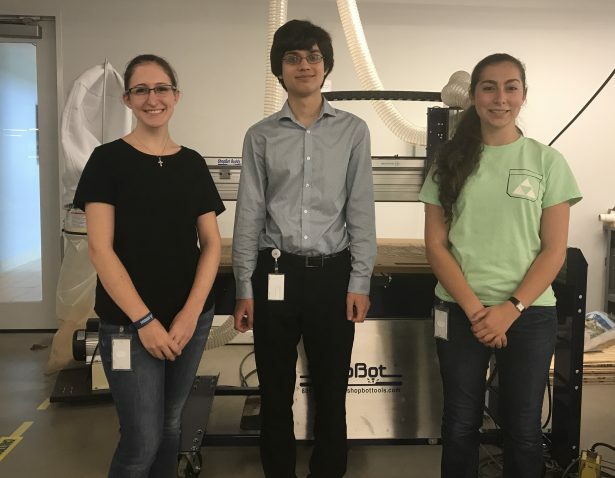 Here at DASSAULT SYSTEMES three interns are working in our brand new 3DExperience Lab and paving the way for what future interns should aspire to be; building blocks for a company’s next generation of innovative ideas. 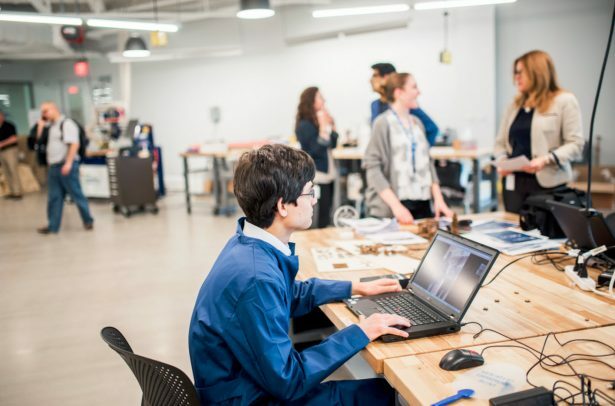 The 3DExperience Lab, most commonly known as the Fab Lab among DASSAULT SYSTEMES’s employees, opened on May 30th of this summer, in Waltham Massachusetts. The concept of the 3DExperience Lab started in Paris, two years ago, and is now connected to over one thousand other maker spaces through the Fab Foundation Network. 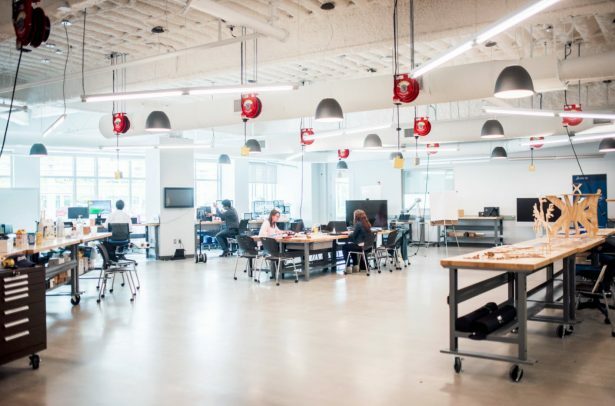 With the help of MIT’s Center for Bits and Atoms, the 3,100 square foot lab is made for startups, entrepreneurs, engineers, and students to collaborate together and innovate products for future sustainability. With fourteen different work stations/facilities that range from wood-working to virtual reality, there is no shortage of physical or cybernetic products that one can produce. As MIT helped build the platform for the 3DExperience Lab, they also offered mentor training sessions in April. The training sessions were held for those who would mainly be working in the lab, so that they could become mentors and then train others who were interested in participating. This was the case for one mechanical engineering student, Patrick Schluper, who decided to become an intern at DASSAULT SYSTEMES as a part of his Northeastern University CO-OP program. Patrick continued to tell me how his development working in the lab has given him the ability to teach other full-time employees about its facilities. “Yesterday even… I trained [around] twenty people. There was vinyl cutter and laser cutter training [that I did] and showed them how to use everything.” Patrick is now a very skillful instructor in the 3DExperience Lab, but he isn’t the only intern who is capable of teaching other employees. Shawna Hansen, a Corporate Paralegal at DASSAULT SYSTEMES, was looking for the perfect, sentimental Father’s Day gift for her husband. 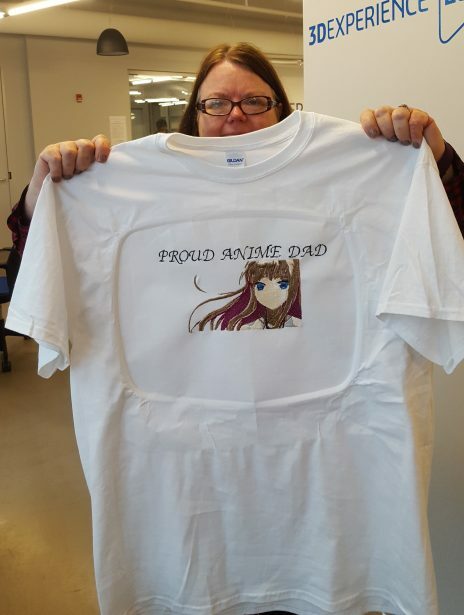 She knew her husband loved anime, but wanted something that was not just an ordinary gift; so, she came up with the idea of creating a custom-made anime shirt for him. This idea spawned from her knowledge of the embroidery machine that was held in the 3DExperience Lab. Since Shawna was set on the idea of making her husband a shirt, she first needed to learn how to use the sewing machine; so, she asked the User Experience Senior Manager, Chin-Loo Lama, to mentor her in the Lab while she would attempt to sew. However, Chin-Loo Lama knew someone else who could assist Shawna better than she could with the project, another mechanical engineering intern, Rachael Naoum. I bet you are wondering how an intern became the go-to expert for an embroidery machine that had just opened. As you can tell, that is sort of the norm around the 3DExperience Lab. 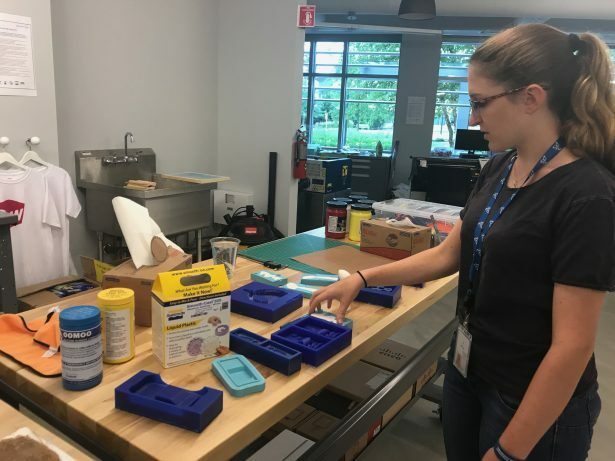 Rachael, a senior at Worcester Polytechnic Institute (WPI), started interning for DASSAULT SYSTEMES a little over one year ago; however, when she started working this summer, there was a different twist to her job. She had to learn how to operate the Fab Lab’s embroidery machine without any mentor training. In an interview with her, she told me, “I’m the exception because I just showed up and Marie (her boss) said, ‘You’re the mentor for the sewing station. Go figure it out.’ [And I said], ‘Okay.’” Rachael mastered the embroidery machine in the fifteen days between her start date and the grand opening of the lab, while it took most other mentors as long as twenty weeks to master their respective machines. Luckily, she had some prior experience. 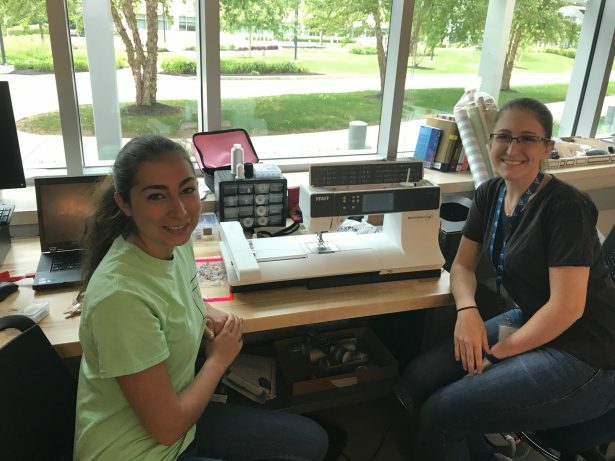 “I’ve been sewing since I was four… so once you know one machine, it’s not that hard to figure out a new one.” Rachael acknowledged the fact that she works with the embroidery machine more than any other facility in the 3DExperience Lab. “Rachael is an accomplished instructor,” Shawna explained to me, “… so from the start, she showed me what to do and then guided me until I could do it fairly decently myself.” After 5 hours of Rachael and Shawna working together to embroider the design onto the t-shirt, it finally came out beautifully. One of those other interns that Rachael is referring to is her fellow partner in crime, Alessandra Paolucci. Alessandra is also a mechanical engineering student from WPI, who joined the DASSAULT SYSTEMES team along with Rachael last year. This summer, she is working with Patrick on the laser and vinyl cutters, as well as teaching other employees how to utilize those machines. “It’s really nice to have two other people in the lab my age, with the same, sort of, experiences. We definitely get to learn everything together, since we are all at the same level.” In essence, the three of them are constantly collaborating as a team. That’s right, they even give tours of the Fab Lab as interns. Before the lab’s grand opening, the three were informing higher up executives of DASSAULT SYSTEMES and other interested partners about what the Fab Lab had to offer. After hearing about these tours I asked Alessandra and Rachael if they could take me on my own personal tour, and they were more than happy to do so. During the tour, they explained in great detail the functions and purposes of each work station and machine, as if they lived in the lab. When I first entered the lab, Alessandra and Rachael were the only two people working in it. Halfway through the tour, no one other than Patrick walked in to continue his ongoing work. “Given that [they] have spent the most amount of time in the 3DExperience Lab, they are quite proficient in using most of the machines,” Abhishek stated. Although Alessandra, Patrick, and Rachael were all tremendous tour guides, that was not the extent of their preparation for working in the lab. “They proactively designed the 3DExperience Lab Playbook that is like a User Manual for an incoming fabber in the lab. It contains a detailed starter-kit with step-by-step procedures for fabbers to follow as they go along using various machines in the Fab Lab,” says Abhishek. Just when you thought these interns could not do much more, they continue to work. “Obviously, we are teaching her how to use SOLIDWORKS [as well as the machines], but my favorite part is telling her things that she shouldn’t be afraid to do. I was afraid to pursue robotics engineering and computer science because I thought, ‘Oh you need to know those things from when you were a child…’ So, I’m telling her now… that she can do whatever she wants to do, and she shouldn’t be afraid.” Aside from training Pranavi, they are also training another high school intern, Nirali Jain, along with two new Northeastern CO-OP’s, Erica Traini and Sean Yeatts. These two CO-OP’s will eventually replace Alessandra’s and Rachael’s positions, for when they depart back to school at the end of the summer. 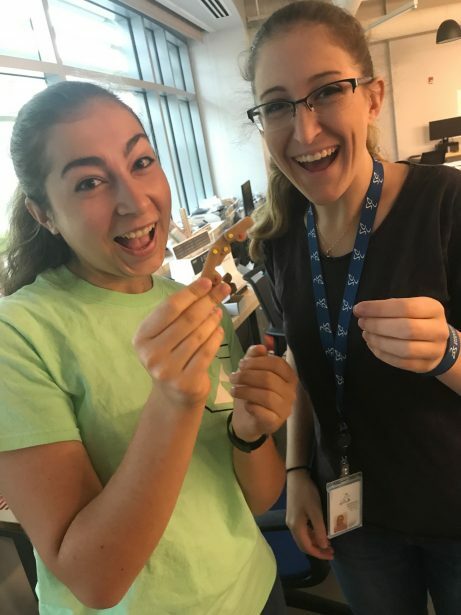 In the meantime, Alessandra and Rachael are currently working on creating a prosthetic arm for their senior project at Worcester Polytechnic Institute. After one week of working on the project, they already have two models for the finger, a laser-cut and a 3D printed model. “We want to see a couple different things,” Rachael said. “Which manufacturing technique is stronger, [which one is] easier to assemble, [which one] requires fewer pieces, [which one is] easier for someone to make, say, in the Fab Lab in Rwanda?” The project is still in the works, but the two engineers plan to have the arm finished by spring time. Interns with the capability to teach full-time employees about the company’s assets, are not something that you see with every business. Alessandra, Patrick, and Rachael are paving the way for a different style of interns; a style where employees and executives can learn from students, and gain a different perspective from them on certain matters. Corporations can add so much insight from bright young minds, as the generational gap with most other full-time employees can be of value. With the variety of technology that is presented to interns at such a young age, their mindsets, along with executives’ and other employees’ experiences, should be able to create long-lasting platforms for businesses all around the world.